Just in time for Spring, DesertX lured us to Palm Springs, a city rich in mid-century style, architecture and retro signage - three things we love and tend to seek out. We were thrilled to experience the art and love how this festival helps place special attention on the environment of the Coachella Valley. On through April 21, 2019, this freshly minted biennial is a brilliant fusion of art and environment, where contemporary artists stage their works against the dramatic landscapes, leaving us in a state of hypnosis. This year, we explored the highlights of DesertX at magic hour, just before and after the sun set. Here are a few of the compelling installations that stayed on our minds, post-visit. Can’t make it to Palm Springs? Explore the art via the DesertX app or the DesertX Instagram. 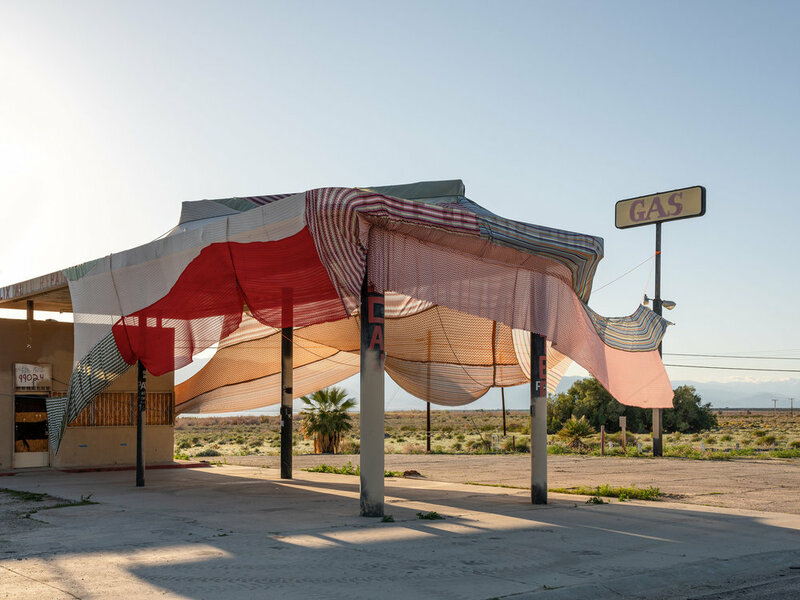 Wormhole occupies empty storefronts in the Coachella Valley cities of Palm Springs, Cathedral City, Indian Wells, Indio, and Coachella as well as one in the city of Tijuana, Mexico. Beyond the glass, a television monitor displays the exterior of one of the storefronts in the grouping. The viewer encounters the wormhole, a shortcut through space and time, creating a kind of physical, temporal, and subjective crossing between spaces. Wormhole “transports” viewers to another location, addressing the close proximity of the Coachella Valley and Tijuana, the fragility of the frontiers, and the boundaries between the cities and countries. It was the unexpected discovery of an abundance of fossilized marine life more than 100 miles inland from the Pacific shore that led the early Spanish settlers to name this valley Conchilla, which means “little shell.” Because of a mis-spelling the region became known as the Coachella Valley, thereby stripping it of the reminder that 6 million years ago, what is now desert had been underwater and connected to the so-called Western Interior Seaway. For the Danish collective Superflex, geological history and the not-so-distant future meet in the recognition that with global warming, rising water levels will again submerge the land- scape along with all the structure and infrastructure that made it habitable for humans. Rethinking architecture from the point of view of future submersion, their mission has been to create land-based forms equally attractive to human and marine life. Using the preferred color palettes of Walter and Leonore Annenberg, Palm Springs, and marine corals, Dive-In merges the recognition that global warming will drastically reshape the habitat of our planet with another more recent extinction: the out- door movie theater. Here the interests of desert dwellers and sea life come together in the coral-like walls and weekly screenings of a structure born of a deep past and shallow future.